A few weeks ago I enjoyed a weekend trip to the Tennessee/North Carolina border for a 2-day hike with a group of friends from Raleigh. This was my first experience camping along the trail and it was one I won't soon forget. Beyond the fact that the area is beautiful, there is something quite enjoyable about being away from the rush of it all. Without cell service and modern conveniences, time on the trail meant good conversation and time to truly enjoy the people next to you and the beauty around you. So here's a run down of what I took away from this trip: 1. Anyone who hikes the AT, or even a significant portion of it, has my full respect and admiration. 3. If you are having trouble being thankful and you have a bed and restroom, well... there's a good starting point. 4. The scenic views of WNC and Tennessee are a natural masterpiece. 5. I am blessed to have friends that are kind, selfless, and a true joy to be around. So here's a few shots from our weekend. Most are from my iPhone as it was pretty damp for most of our hike and the less weight I could carry in my hands the better off I was. 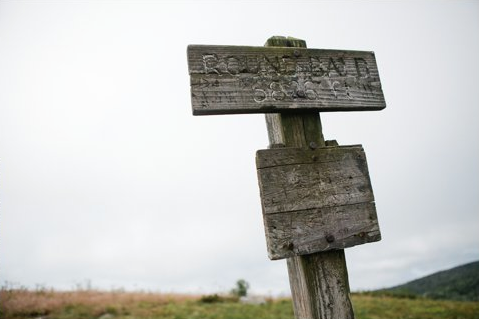 We hiked around Roan Mountain. We began our trip at Carver's Gap and hiked to Overmountain Shelter. If you like uphill climbs, steps, mild exhaustion and being in the woods, be sure to check it out. All joking aside, it was beautiful and we had a great time.